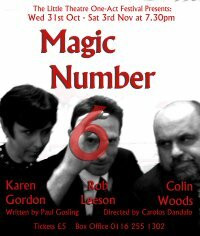 Following on from the announcement below several weeks ago, more details have been published regarding "Magic Number Six", a one-act stage play written by Paul Gosling concerning Patrick McGoohan's relationship with Lew Grade. The cast is now in place, which includes Rob Leeson as McGoohan and Colin Woods as Grade, and performances are set for 31/10-3/11 2012 at The Haywood Studio in Leicester (TUW will be represented on the Saturday if friends new and old wish to meet up) and tickets are only £5, available from the box office on 0116 255 1302. With thanks to Paul Gosling and David Stimpson for this news item.